Note: In this document underlined hyperlinks link to VS .NET & VSHIK documentation. To make these links work you will need to either add "http://kb.helpwaregroup.com" to your IE Trusted sites zone, or download this page to your local drive (I'm assuming you have these collections installed). Otherwise you can copy the shortcut into Internet Explorer's address bar and click Go. 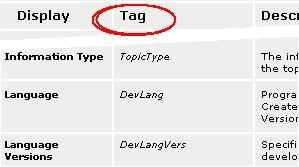 20-June-2002 - Added DevLang section to 1. 18-Mar-2003 - Append new information to section 6 on .HxA files. 20-Jul-2005 - MS recommends that you now plug into MS.VSIPCC. * under VS 2005 v8.0 and greater. And the MS.VSCC. * collection for VS 2002 v7.0 and VS 2003 v7.1. 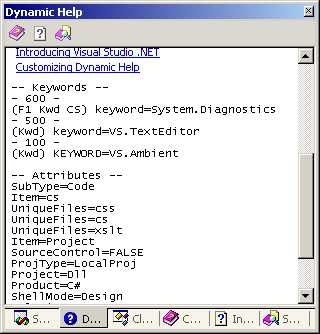 Dynamic help has been played down in VS v8.0 IDE (general search has been improved). 1 1. Determine which MSHelp attributes and values to place into your topics. 1.1 2. Determine additional, custom attributes that you want to make available as criteria for filtering. 1.2 3. Determine which keywords to add to your topics. 1.3 4. Add all attribute markup and keywords to the XML data island of your topics. 1.5 6. Add attribute schema to .HxA files. When you work with the Visual Studo .NET integrated development environment (IDE) one way you can provide help for a Windows application (ms-help://MS.VSCC/MS.MSDNVS/vbcon/html/vbtskprovidinghelpinapplication.htm) is through the use of the HelpProvider component. You can attach Help topics within a Help file (that is either of HTML or HTMLHelp 1.x or greater format) to specific controls on Windows Forms. At runtime you can display a help topic related to an element of your application's user interface by either clicking the element with the What's This cursor or setting focus to the element and then pressing F1. In addition you can use the HelpProvider component to provide Pop-up help (ms-help://MS.VSCC/MS.MSDNVS/vbcon/html/vbtskdisplayingpopuphelp.htm). 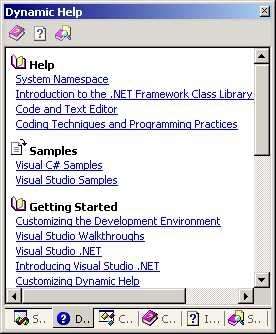 In addition to F1 help, Visual Studio .NET includes a new user assistance feature, the Dynamic Help Window. This window provides links to topics that are specific to the current area you are using or task you are trying to complete within the IDE. The IDE tracks the selections you make, the placement of the cursor, and the items with focus as you interact with what's on the screen. The Dynamic Help window then filters through the topics available in all collections that have been plugged into VS Help Collection (see Note#1) to display relevant information. So as you type or focus on different windows, the Dynamic Window updates the information available to you. Dynamic Help is particularly useful if your H2 help project documents an assembly with syntax, reference, samples, or how-to topics. Make sure to read the current Visual Studio Help Integration Kit (VSHIK) whitepapers "Visual Studio .NET Help Integration" and "Integrating New Content with Dynamic Help". They discuss these features. The VSHIK documents are works in progress, but contain valuable information. If you don't have VSHIK, you can downloadit from MSDN. Here, we'll distill this information down to several essential steps. It should help you enable these features for your help system easily. 1. Determine which MSHelp attributes and values to place into your topics. The Locale attribute is required for Dynamic Help. As its values imply, it is based on the language of the help collection. Users of your help system can choose which topic types to display in the Dynamic Help window property sheet. See Customizing Dynamic Help in the MSDN Visual Studio documentation for details. DocSet is commonly seen in visible filters for collections in Edit Filters dialogs. Your topic will be pushed only in the context for which it has a DevLang attribute. Note though, that if you don't add any DevLang attributes, a conflict will not be present and Dynamic Help will include the topic. The TargetOS attribute identifies whether a topic deals with Windows, Windows CE, or both. MS recommends that all topics contain the TargetOS = Windows attribute, however this is not required. Topics that are applicable to the Windows CE platform should also contain TargetOS = WindowsCE. You can add any number of additional Microsoft attributes. They are useful for the internal filtering of dynamic help so you don't wind up with an umanageable number of topics in the Dynamic Help window. The VSHIK help provides a complete list of attributes (ms-help://ms.vshik/vshelpintegr/html/hxgrfVisualStudioAttributes.htm) that can be used in conjunction with the Visual Studio .NET documentation. You can use the same set of attributes as The Visual Studio .NET Combined Help Collection. If you define custom attributes, use this reference topic to ensure that existing attribute names are not duplicated. When adding attributes from the table, always use the text from the Tag column rather than the text in the Display column. So for example, use TopicType rather than Information Type and kbArticle instead of Article. 2. Determine additional, custom attributes that you want to make available as criteria for filtering. 3. Determine which keywords to add to your topics. You can add any number of keywords and keyword types to your topics or to the appropriate index file; however, only "F" keywords impact Dynamic Help. "F" keywords stored either in an .HxK file that has a Name property of "F" or that are inserted as an "F" Index Keyword in the XML data island of the topics themselves provide the link to the topic to be displayed. 4. 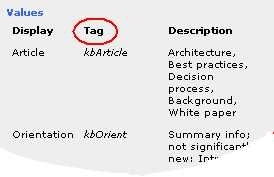 Add all attribute markup and keywords to the XML data island of your topics. so that the ValueName Display Debug Output in Retail is set to YES. Note that if an "F" Index Keyword is not found, Dynamic Help searches the "K" Index Keyword list for matches. As you can see in the illustration these keyword types are pushed as [Kwd]. To disable the debugging state, change the registry key back to NO. 6. Add attribute schema to .HxA files. MS now recommend the following in regards to using .HxA attribute definition files. You do not need to compile a .HxA file at the title level into your project. Not including a title-level .HxA means that all topic attribute tags will be compiled into the final HxS help file. This is exactly what we want. If you do compile a .HxA into your project, you must make very sure that it contains all attributes used including the VS attributes used. Compiling in a .HxA is like creating an attribute filter for the compiler in that only attributes declared in the .HxA will be compiled into the final .HxS help file. MS advise against this method because it is too easy to make a mistake. The collection-level .HxA (the one you ship uncompiled that contains no DTD reference - as shown above), must define all the title attributes you want to expose at the collection level. No collection-level .HxA file would mean your attributes would not show at all. The collection-level .HxA does not need to declare the VS attributes you have used. Since these attributes are already declared in the VS collection you are going to plug into. Declare the LinkGroup in the Dynamic Help XML files. You can add define as many LinkGroups as you want. Note that the ID must not contain spaces; however the Title may. It's the value of Title that will be visible in the Dynamic Help window. If you want to position your custom LinkGroup higher up in the Dynamic Help window you must change the Priority setting in the .xml file that defines it. The setting is relative to the values of the other groups. The example above sets the Priority to "300". 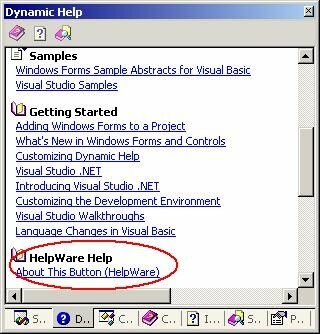 This positions the HelpWare Help group beneath most of the Visual Studio .NET LinkGroups. A higher value, for example, "1000", will position your group at or near the top of the list, depending on the context. Note that the Name item in AttVal matches the ID in the LinkGroup definition file and the value of the attribute in the topic's XML data island. Note: 1033 is for English language help. For non-English Windows you will see a different Language ID. The attribute definitions are in Col_Master.HxA and h2reg.HxA. Note: The h2reg.HxA file is no longer compiled into H2Reg.HxS help file (no longer used). See part 2 of section 6. The topics that have "F" keywords are html\dynamichelp1.htm and html\dynamichelp2.htm. Note: To view these files you will need to decompile the H2Reg.HxS help file. To the form that Visual Studio .NET adds to your project automatically, add a Windows Forms Button control. Display the Dynamic Help window. Select either the form or the button — you'll see a custom LinkGroup and a link to a topic. Similarly, in the Code Editor if you click or select either System.Windows.Forms.Form or System.Windows.Forms.Button a custom LinkGroup and a link to a relevant topic will appear in the Dynamic Help window. Note#1: For MS VS 2005 (v8.0) and greater MS now recommend you plug into MS.VSIPCC instead of MS.VCSS. This keeps 3rd party collections grouped together and out of the way of core collection files (for stability). Once you've plugged your help collection into the VS Help Collection, you can use Dynamic Help in concert with your assembly or application. As you move the cursor into a context, the Code Window, for example, you'll see how the Dynamic Help window changes. At this point you can either press F1 to get the first topic listed in the Help section, or you can click any one of the links in the window. If this is not the location of your VS .NET then please copy the file manually.